"Girls are better than boys," says 30-year-old Al-Munnahar. "Boys do not listen. They are arrogant. Girls are polite." The walk to Failla Para, Al-Munnahar's village, is arduous: in the dry season, the narrow track leads into a swamp, and in rainy season, into the sea. The village itself is not much more than a mound of mud with a few shacks and a chicken pen perched precariously on the slippery surface. "Nothing grows here anymore," says Al-Munnahar. Not many years ago - up until the 1990s - these swamp lands were paddy fields. 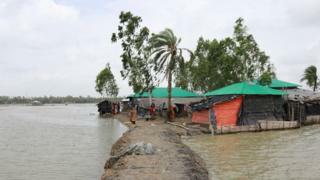 "This is climate change in action," says Dr Manzoor Hanifi, a scientist from the International Centre for Diarrhoeal Disease Research Bangladesh (ICDDRB), a research institute. "The effect on the land is visible, but the effect on the body: that we don't see." 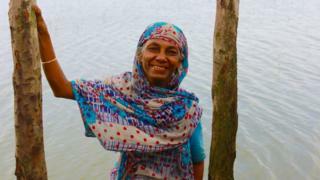 ICDDRB have been running a health and demographic surveillance site in and around the district of Chakaria, near Cox's Bazaar, for the last thirty years, enabling them to detect even small changes in the health of the communities they monitor. "We paid a 230,000 Taka ($2,752, £2,106) bribe to build the house," says Kajol Rekha, who moved to the hills from the plains with her husband and two children three years ago. "Because of the water, my kids would always have a fever, especially when our house remained wet after the flood. Everything is easier here." This difference, the scientists believe, is to do with the amount of salt in the water the women drink - the increase of which is caused by climate change. Sea levels are rising, in part because of the melting of icecaps, but also because the earth's rising temperature affects atmospheric pressure: even a small change in this causes an inverse effect on the sea level. "With a one millibar decrease in atmosphere pressure," says Dr Hanifi, "the sea level rises by ten millimetres: a series of depressions in atmospheric pressure can cause a considerable rise in water levels in shallow ocean basins." When sea levels rise, salty sea water flows into fresh water rivers and streams, and eventually into the soil. Most significantly, it also flows into underground water stores - called aquifers - where it mixes with, and contaminates, the fresh water. 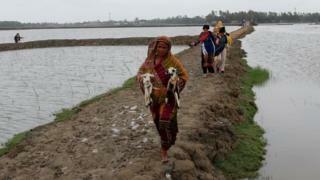 It is from this underground water that villages source their water, via tube wells. The water that the village pump in Failla Para spews out is a little red in colour. It is also full of salt. This does not stop villagers drinking from the pump, though - nor from bathing in it and washing and cooking their food in it. The World Health Organization (WHO) recommends that people consume no more than 5g of salt per day. In Chakaria, those living in the coastal zone consume up to 16g per day - over three times what those in the hilly areas do. "Salt is bad for crops," says 50-year Janatara, who was born in the village and has never left. When asked if she or her family would leave Failla Para she laughs: "No, of course not! I've been here my whole life, and anyway, where would we go? We are poor." She is uncertain what future there can be for her two sons in Failla Para: "Life is so hard here," she says. Despite this, though, she plans to have another child soon. 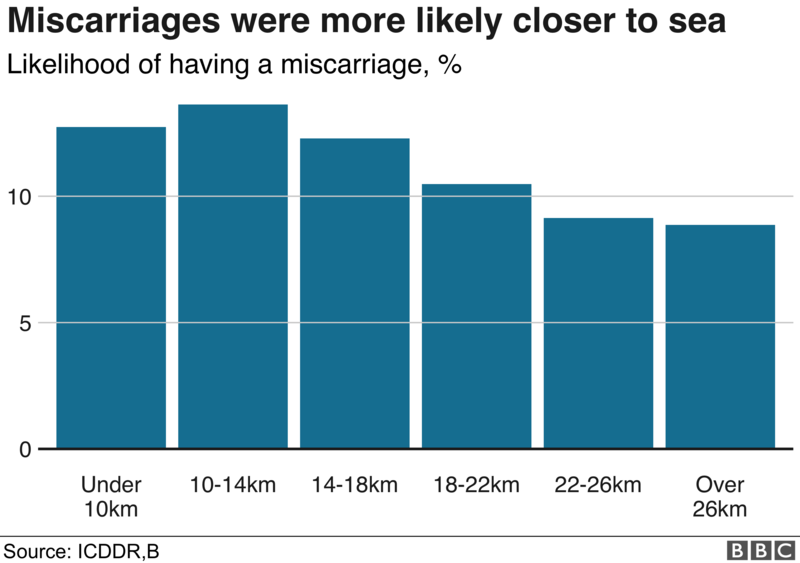 Coping with a miscarriage: "It can be a very lonely place"
At the moment, the chance of miscarriage for women like Sharmin and Al-Munnahar is only slightly elevated. 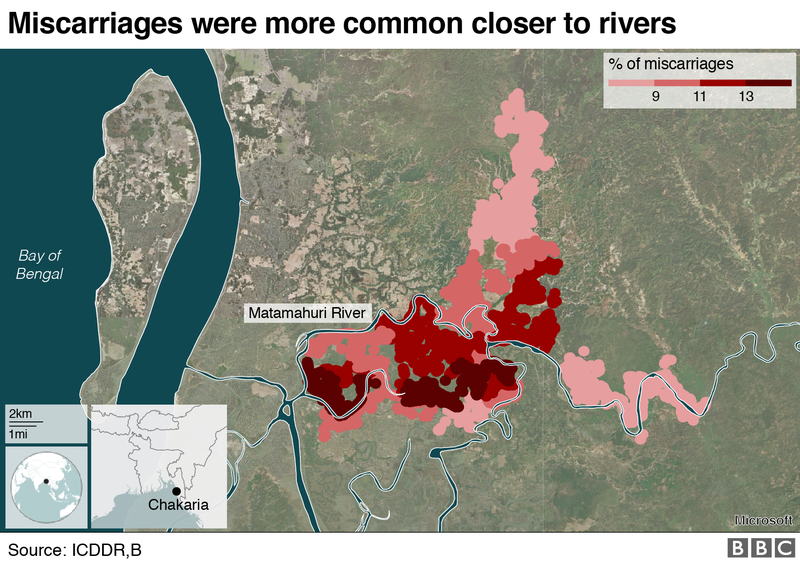 But unless something is done, says Dr Hanifi, "this will only get worse, as Bangladesh feels the effects of climate change more and more." "A lot of money is being thrown at climate change interventions," says Dr Hanafi, "but almost none of it goes into research - not for the public health impact anyway. Everyone is thinking about environmental disasters. No one is thinking about public health." Video Coping with a miscarriage: "It can be a very lonely place"